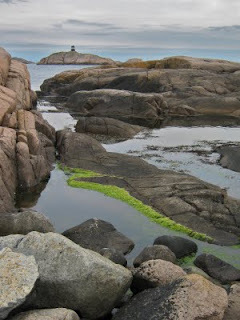 The rock is pink granite, it is worn smooth by the crashing waves. This view is on the far side of the island, facing the ocean. Denmark would be off to the right and far across the sea. It's hard to describe the not-so-quiet magic of a place which is composed of water-tossed rock and sturdy heather. Being in the midst of such natural beauty puts the concerns of commercialism and competition in a distant perspective. What an incredibly beautiful place. This is the kind of image that inspires me. Thank you!